On my recent visit to CBS12 (WPEC) in West Palm Beach Florida, I talked about how our TWO brains can determine our cravings, our mood, and our overall health. WEST PALM BEACH, Fla. (CBS12) — Some of the problems we associate with the brain may actually be the result of faulty signals between our brain and our gut or second brain. Scientists refer to your gut as your second brain because it determines a big piece of your mental wellness. What your gut tells your brain and vice versa is connected to your mood, immune system, and food cravings. Dr. Shawn Talbott says if it’s not sending the right signals to the brain, it may lead to feelings of stress, fatigue and anxiety. There are several things we can do to balance our gut/brain axis so that we feel better physically and emotionally. 1. Bring on the fiber! There are two types of fiber: insoluble and soluble. Insoluble is like nature’s broom. We don’t digest it, and it carries toxins with it as it exits our bodies. Soluble fiber absorbs water and helps to normalize digestion. It can also act as a prebiotic, which means it feeds the good bacteria in our gut. I like soluble guar fiber, because it has been shown in more than 120 clinical studies to support digestive health without the uncomfortable side effects. It also triggers the release of satiation-inducing hormones, so you may not feel as hungry. 2. Add fermented foods to your diet. Kimchi, yogurt, kefir and kombucha all help to maintain a healthy balance of gut bacteria. 3. Feed your gut and brain plant-based phytonutrients and amino acids. Amino acids are used by the body for many physiological functions. One amino acid found in matcha or theanine has been shown to promote relaxation without causing drowsiness, reduce nervous tension, and help prevent the negative side-effects of caffeine. It’s a great brain nutrient. Check out Best Future You for more information. Here are a few videos where Amare Founding Wellness Partner Pat Hintze and I discuss the emerging science of the microbiome, the gut-brain-axis, and how Amare Global products support Mental Wellness in complementary and holistic fashion. Super-interesting study (in flies) showing how modulation of microbiome balance and optimization of gut-brain-axis signaling might not just reduce a wide range of diseases, but actually extend lifespan and health span. Longevity extension in Drosophila through gut-brain communication. This is a terrific article on leadership and employee engagement. How do we instill a sense of PURPOSE in the people that we work with? I think the we’re trying to do this everyday at Amare Global – with our vision of leading the global mental wellness revolution. Should Leadership Feel More Like Love? 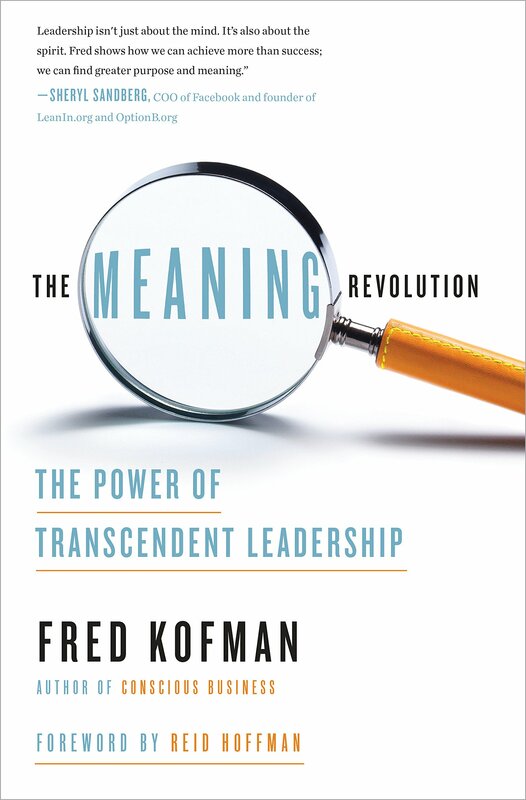 Employees increasingly need a sense of purpose, says Google leadership development adviser Fred Kofman. Six-figure salaries and free lattes in the break room are enticing, but corporate workers increasingly are seeking something more. They want a sense of purpose, a feeling of true camaraderie, and a belief that they are having an impact within the company and outside of it. That’s where good leadership can make all the difference, says Fred Kofman, an adviser in leadership development at Google and former vice president of development at LinkedIn. His latest book, The Meaning Revolution: The Power of Transcendent Leadership, suggests that leaders should set goals greater than simply making quarterly numbers. Kofman joined the Knowledge@Wharton show on Wharton Business Radio on SiriusXM channel 111 to discuss how managers can execute his management ideas. Every week or so, I do a Zoom call where I talk about a different aspect of science related to Mental Wellness – everything for stress to depression to neurotransmitters to immune functions, etc. We post the recorded calls (videos) at ZoomWithPat.com and also on my YouTube channel at the links below. Many people have asked me for the slides – so I have included links below to download the slide decks that I used during each call. I hope you enjoy these mini-seminars, and please let me know any comments you have and what topics you’d like to see covered in coming episodes? Topic = Metabolism = How gut-brain-axis modulation and Amare products may help with “metabolism” issues such as insulin/glucose/thyroid/diabetes/obesity. Topic = Importance of Gut-Brain-Axis Balance for ADHD/Autism (how to maintain efficient crosstalk between our two brains). Topic = Targeted Nutrition for Cellular Protection (how to not only directly protect your cells with the right nutrients, but how to use phytonutrients to stimulate cells to protect themselves with enhanced production of antioxidant enzymes, stress response proteins, and activation of anti-aging pathways). Topic = Enhancing the “Axis” portion of the Gut-Brain-Axis (how and why the communication network between our “two brains” is so important – and how you can enhance it’s efficiency). Topic = “Detox Effect” – what happens if you feel WORSE before you feel BETTER? (this can comseimte happen to some people going thru a “rebalancing” regimen that may include dietary changes, supplements, exercise, etc – but the “bad” feelings will pass and you’ll feel better as your body adjusts. Nice review from Greek researchers on the role of STRESS leading to adverse changes in body composition = loss of muscle (sarcopenia) and gain of fat, especially belly fat (abdominal fat accumulation). Recent studies have suggested that body composition is key to health and disease. First, fat tissue is a complex, essential, and highly active metabolic and endocrine organ that responds to afferent signals from traditional hormone systems and the central nervous system but also expresses and secretes factors with important endocrine, metabolic, and immune functions. Second, skeletal muscle mass is an important predictor of health in adult life, while severe mass loss has been associated with the frailty of old age. Studies have shown that skeletal muscle is also an important endocrine organ that secretes factors with autocrine, paracrine, or endocrine actions, which have been associated with inflammatory processes. Third, the bone is also a systemic endocrine regulator playing a pivotal role in health and disease. Finally, proper hydration in humans has been neglected as a health factor, especially in adults. Chronic stress and stress hormone hypersecretion alone or associated with distinct disorders, such as anxiety, depression, obesity, metabolic syndrome, autoimmune disorders, type 2 diabetes mellitus, and polycystic ovary syndrome (PCOS), have been associated with psychological and somatic manifestations, typically, increased fat mass, osteosarcopenia/frailty, cellular dehydration, and chronic systemic inflammation. This review aims to provide new insights into the newly developed concept of stress-related osteosarcopenic obesity and its prevention. Coming close on the heels of winning “Best New Finished Product” (of 2018) for our FundaMentals Pack for supporting Gut-Brain-Axis and improving Mental Wellness, Amare’s “Mood+” product for improving mood/stress/tension has now been nominated as “Botanical Product of the Year” – and the company itself has been nominated as “Startup of the Year” by natural products industry leader Nutra-Ingredients-USA. When it comes to optimal brain nutrition and neuron protection, there really is no better option than Amare’s VitaGBX. Why? Because it’s the only comprehensive multi-nutrient to nourish both the body and the mind in a holistic way. VitaGBX is the ONLY product that activates the entire family of Cellular Defense Responses (CDRs) that not only protect cells throughout the body, but also stimulate them to protect themselves. Activating a family of cellular “switches” (the CDRs) induces a series of cellular anti-stress genes and increases production of internal antioxidant enzymes and related protective proteins. One way to think about the coordinated cellular defense response (CDR) and the multiple cellular defense pathways that can be activated by certain herbs and nutraceuticals, is to think about the protection to our national defense provided by multiple armed forces. In many different ways, our nation, cities, and communities are protected from various threats by the local police or fire departments; the CIA/FBI; the National Guard and Coast Guard, and all the way up to the “big guns” of the Army, Navy, Air Force, and Marines. The “level” of response and protection will depend on the route and the type of threat (stressor) encountered. When we activate the local and national defenses to protect the country, it’s very similar to activating the wide range of cellular defense responses (CDRs) through multiple internal biochemical pathways that go by abbreviated names such as NfkB, SIRT1, Nrf2, mTOR, HSP70, and myriad others. You might think of the CDR pathways as an internal “thermostat” for cellular stress. Whenever a cell is under stress—whether from oxidative stress, inflammatory stress, aging stress, or any type of other stress that our modern world might throw at us, the CDR pathways sense the stress and induce numerous protective responses. Some of these responses help to reduce free radical damage, or oxidative stress (antioxidant enzymes), while others help to clean up damage (housekeeping proteins), and still others prepare our cells for exposure to future stressors (heat shock proteins). This natural induction of CDRs is very much a “master regulator” of the body’s antioxidant and protective response—and the same mechanism at the heart of numerous new biotechnology and pharmaceutical research projects. In many ways, the natural induction of CDRs is the future of holistically maintaining proper internal balance, protecting our bodies from destructive environmental factors, and encouraging the repair mechanisms to help us thrive in the face of a world filled with biochemical imbalancers and cellular stressors. There are a number of products on the market that only activate the Nrf2 pathway (antioxidant) – and other products that inhibit the Nfkb pathway (anti-inflammatory) – and others that activate SIRT (anti-aging) or mTOR (metabolism) or HSP70 (stress), or autophagy (cellular cleanup) – but VitaGBX is the only formula that balances ALL of these vital CDR pathways to provide ultimate protection to delicate brain neurons and the trillions of cells throughout our entire body.